Canals? Are they channelling canals? In our February Fethiye news round up, we mentioned that lots of Günlüklü saplings had been planted along the area in front of the state hospital (Develet Hastanesi). You can see some of those saplings here, amongst the spring wildflowers. Amazing how a construction site can take on natural beauty, isn’t it? Gotta love lower league Turkish football – never got a clue what’s going on. And we do love it. Well, the photo above is just lovely. We’ve had a couple of midweek games played in the daytime through March. That means Kale Arkası (the stand behind the goal) is opened up to school kids and they can wander in for free. Note the older teenage kids across the top row in a long line – well they don’t want to be seen sitting amongst the younger school kids – why would they? We’ve noticed a pattern over the last few years of writing this blog – we tend to feel the need to tell you about new places where we’ve eaten throughout winter and early spring. Guess we’re too busy enjoying summer with friends during the hotter months…grabbing a tost here and there or a quick burger or kebab. Anyway, the warm springtime early March weather (and coveting friends’ food as we passed them on walks along the beach) saw us try out Lighthouse Restaurant. 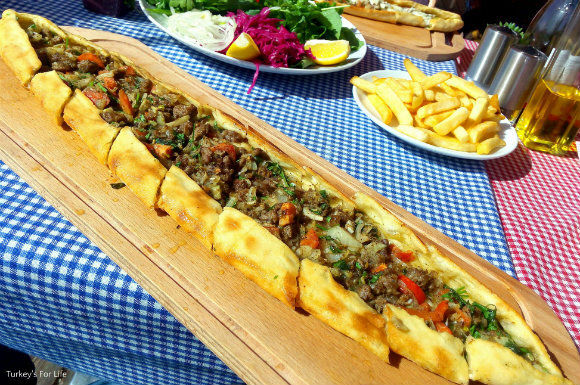 They’re now doing a great, simple homemade pide, pizza and güveç menu at very reasonable prices and, as you can see in the photo above, we’re not complaining about the pide! Great to be able to sit along Çalış Beach and enjoy a simple menu containing some classic Turkish food. 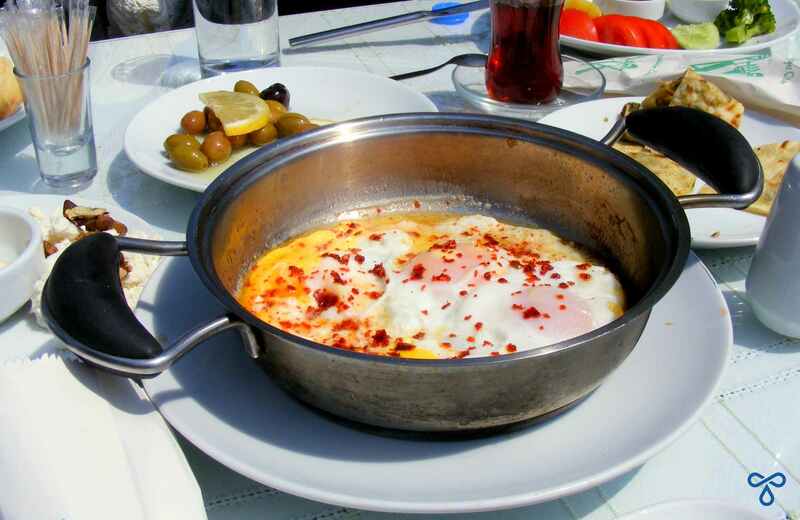 Yes, for many people, Easter fell in March this year (we know the Orthodox Easter is yet to come) and, as Easter is a bit of an egg celebration, we decided to quit the chocolate variety and share our favourite Turkish recipes which celebrate eggs. Call it a tenuous link if you like, but well, it’s spring and the markets are packed with village eggs. It works for us. Özlem of Özlem’s Turkish Table was also in Easter mode and shared her recipe for a special Easter bread found in Istanbul all year round. And March is also strawberry season, so, of course we had to buy some from the pazar. We used most of them with yoghurt and honey, added some to our muesli recipe… but our purchase also prompted us to update our strawberry sandwich recipe, too. Spring is abundant with seasonal food. The appearance of young bakla on the market reminded us to update our recipe for broad beans and sucuk; we’re getting there slowly with our recipe updates. Oh, yeah, and we also spotted some çiriş otu on Çalış market last week. We bought some and made a classic Turkish dish with them so there’s a brand new recipe to come soon – and don’t worry, there are alternatives to the mystery çiriş so you can still follow the recipe wherever you are. 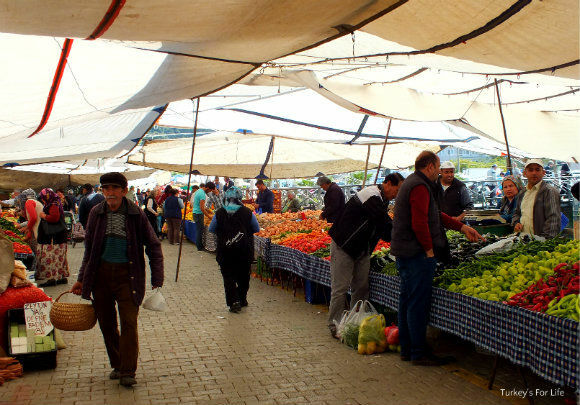 We’re always in love with markets but there’s just so much going on in springtime – and that meant we just had to create our gigantic guide to the Fethiye Tuesday market. 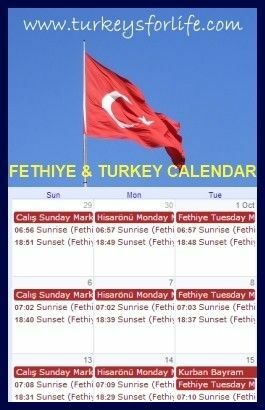 March 8th was International Women’s Day – and it’s always an event in Fethiye. This year, Women’s Day was the day that Fethiye’s new memorial was opened, dedicated to a Turkish student, Özgecan Aslan and to other women, too. Our blog post about it is coming up very soon – we were in Antalya for the opening but we’ve visited since, so we’ll not say too much here. And that just about sums up another month. We’ve got loads to tell you in future blog posts – more Turkish recipes, more places to eat in Fethiye, general goings on, travels past and future. Wishing everyone who works in tourism a successful season. Hayırlı Sezonlar! I’m hoping Bodrum Spor might catch up with Fethiye and we’ll have an excuse to meet/ We live beside the football pitch in the winter.